The Bedol Water-Powered Clock offers a new way to power your clock without resulting in even more waste to pollute the environment. It also prides itself in being the first device from the company to fall under the “Green” product line. 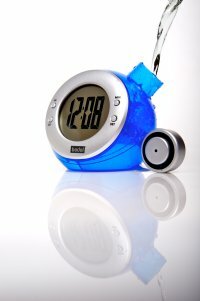 The Bedol Water-Powered Clock, with its stylish circular design and bright attractive colors, makes it a fun, versatile and environmentally friendly product for everyday use. A dash of salt in the water is all that’s needed for the clock to harvest energy and operate. A great feature for holiday gift ideas, this stylish desktop clock will please the eco-conscious and gadget-savvy person on everyone’s gift list. Hopefully when it ships to the customer, it won’t come in a really large box with plenty of empty space inside. Please do not advertise these type of things as eco-friendly. They are not powered by water in any way whatsoever. The water merely acts as an electrolyte, alowing two bits of metal to act as a perfectly conventional battery. It will eventually stop working as the metals inside degrade, and you will have to throw it away. With an ordinary clock, you could at least put in a new cell. I bought this clock and it stopped working three days after i got it.